Brendan Sheeran was guitarist in jazz rock rock Aura with Mick Killian (clarinet), Garrett Brown (bass) and Brian Despard (drums). They played the Foxrock Folk Club in October 1971. 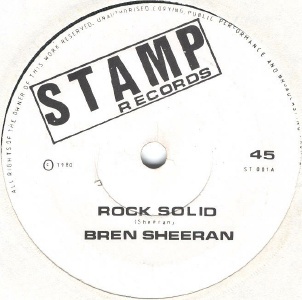 In 1974 Sheeran began the School of Guitar Dublin, giving guitar and bass lessons. The school continues to this day. During 1975-76 he played guitar with another jazzrock outfit Naima which also featured Leo O'Kelly (of Tir na nOg, vocals), Trevor Knight (keyboards), Garvin Gallagher (bass), Andy Boland (lead guitar), Mark Costigan (rhythm guitar) and Fran Breen (drums). I lose track of any further band activity until his 1980 solo single. Both sides are credited to Bren Sheeran, the A-side a rock/prog instrumental, the B-side semi-instrumental and more Eddie Van Halen that Jimi Slevin. Sheeran's old Aura bandmate Garrett Brown later worked in the oil exploration industry and currently lives in the middle east where he continues to play, while Brian Despard became a sound engineer. 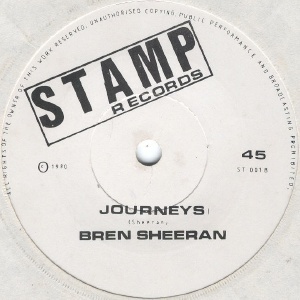 7" - Stamp Records - ST 001 - 1980 - no PS; some copies in stamped diecut white sleeve.